Meringue Cookies - Let the Baking Begin! 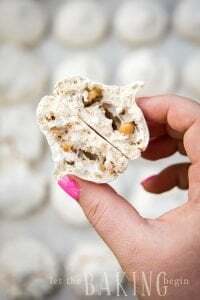 The Meringue Cookies are light, airy and can be served as a light little dessert, or built into many cakes and desserts. Follow the simple photo step by step instructions to learn how! You can add chopped chocolate or nuts into the meringue to additionally flavor the Meringue Cookies. You will need to be very careful folding it into the meringue as not to deflate the meringue and cause it to not dry properly in the oven. TIP: Use about 3/4 chopped chocolate or chocolate chips per recipe, or 3/4 cups to 1 cup nuts chopped to small pieces. Start by making meringue following THIS RECIPE. Fit a pastry bag with a large french open star tip (ATECO #869) (or any other tip) and fill the bag with meringue. Now put parchment paper on an upside down sheet pan, or a cookie sheet. Pipe stars about 1 inch apart. Bake in preheated to 225F oven for 2 hours. TIP: To check if the cookies are done baking, take ONE cookie out and break in half. Allow to cool. Check the inside of the meringue. If it is dry on the inside, turn off oven, leave the oven door ajar by putting a wooden spoon in the crack. Allow to completely cool. Tip #2: try not to leave the door open for too long when removing one cookie to check for donneness, as this can deflate the meringue and ruin it. Minimally open the door and shut the door slowly. Banging the oven door when shutting before the meringues are dry can also deflate them. 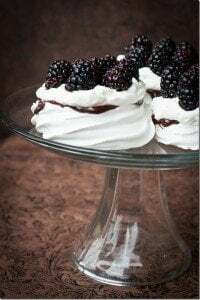 Cherry Chocolate Pavlova Recipe – A simple meringue dessert with whipped cream and cherry sauce. 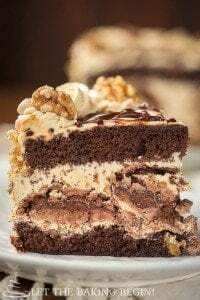 Hazelnut Meringue Cake – Meringue cake with hazelnut. 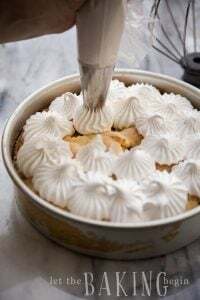 Plum Butter Pirog – Another delicious meringue recipe. Preheat oven to 225F with oven rack in the middle. Make the meringue following THIS RECIPE. Now put parchment paper on an upside down sheet pan, or a cookie sheet. Pipe stars about 1 inch apart. 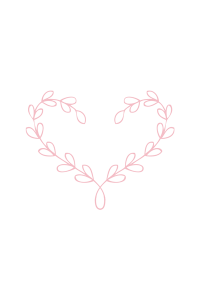 Is it necessary to use parchment paper? Can I use plain paper? Parchment paper is a nonstick kind of baking paper that helps baked goods release very easy. For this reason, the plain paper would not work. 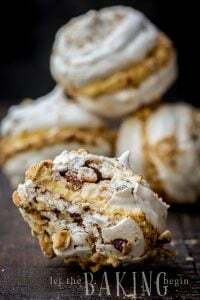 Hazelnut Meringue Bombs Recipe - Let the Baking Begin!